World first: The headliner for the e-Golf is now being fitted by a robot as standard. 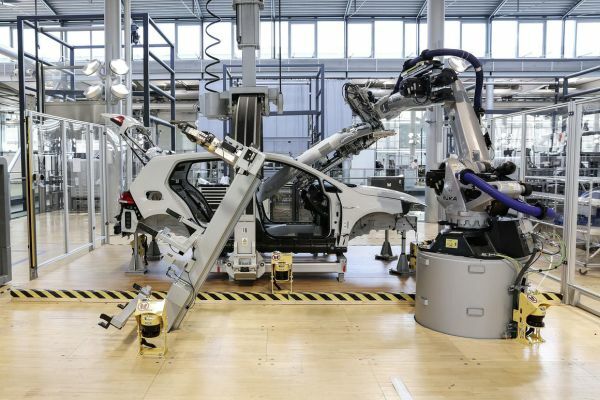 The Gläserne Manufaktur in Dresden is continuing to develop into the Volkswagen Group’s primary test location for trialling innovative technologies. In conjunction with the Wolfsburg and Emden factories, the Gläserne Manufaktur is part of a “technical centre” project. The primary idea is to achieve automation of complex work steps within assembly. The special challenge is that the testing and development takes place on an ongoing basis during production of the e-Golf in the Gläserne Manufaktur. The first project at the Dresden site is a world first – the headliner for the e-Golf is now being fitted by a robot as standard. This manufacturing step will also be used in production of the ID.2 from the end of 2019 at Volkswagen’s Zwickau plant. 1. e-Golf: Power consumption, kWh/100 km: combined 14.1 17 inch–13.2 16 inch; CO₂ emissions combined, g/km: 0; efficiency class: A+.